Thanks! I don't need one but at that price I think I am obligated to pick one up tomorrow before they sell out. Too bad none online. Kinda want one, but not 2 hour ( Moncton NB ) one way for one. Too bad it is not available online right now, that notice wasn't on the Web page yesterday. Calgary store has them in stock, sale price ends tonight at 8. Really wanted one of these, despite the many complaints about droop that is so bad, adjusting the high mounted sights for close distance seem to be impossible. They also don't have the Pal version, just the 495fps ones. Not sure I can convince the missus, after all we added 2 new guns to the collection this month alone. Well, have about 3h to try and make my case. Wish me luck. Update. So I got a somewhat reluctant yes from the boss but before heading there to grab this cool looking springer I did some reading on it. As it turns out Crosman made a serious error in the design of the sights, where you can't rise the rear sight high enough (or lower the front) to allow for close range plinking. Guess they figured since it's a M16 replica that it's intended for 100m shooting? Or maybe someone got the specs wrong and they didn't bother rectifying the problem? Whatever the reason, if I can't use this for basement plinking then Crosman has lost a sale. Or is there a way to compensate for this that's easier/cheaper than purchasing airsoft sights? Are there risers that would work on this picattiny setup? If anyone here has one of these and has found a solution to allow for close range shooting with the stock open sights, please let me know. It would seem the sale is still on. If so I may still nab one. Website shows sale price of $80, guess this is a boxing week sale. Still considering picking this up but first would like confirmation that I could make it shoot at an indoor range using the stock open sights. Would a riser like the one in the pic solve the problem? Lowest one I could find is a .5" rise. Would that be too high a rise for the rear sight? Cut the rear sight carrying handle down like this. So wont need so long of a riser. Problem is the gas block is higher than the hanguard. It should be actually lower. Filing down the front sight wont fix it and only 2 options is well Optic or taller rear sight. Thanks leadslinger, guess this pretty much puts me out of contention for this rifle. Optics would make using this no different than a Phantom, the Air Hawk or any other springer. The sole purpose is being able to make use of the open sights. 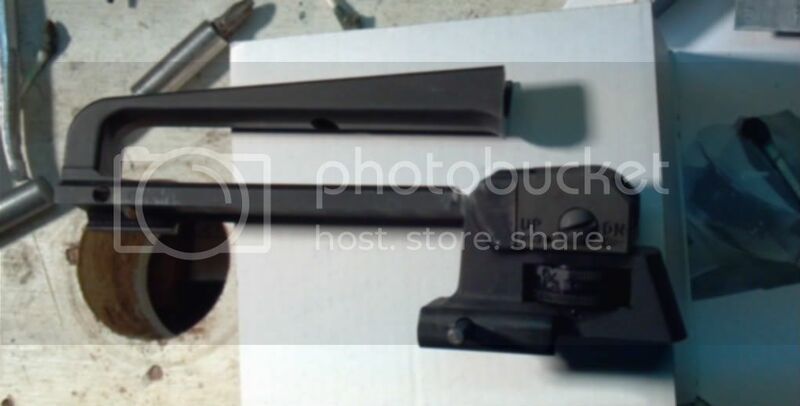 Read on another site that someone had an airsoft AR-15 rear sight that was higher and he put it in this gun. Apparently it worked, despite the non matching painting scheme. It's a smoking deal for a NP but it's the 495 fps version. I decided I did not need another plinking accuracy non pal rifle and learning about the open sights only fortifies my decision to pass on this sale. If they had one online. I would have bought it and put the vantage spring and piston in. Giving me a mid 700 shooter. Wpg. Cabela's is sold out. Wouldn't of minded getting a hands on look. Bargain cave still has R-1O match, both rifle and pistol versions. Walked out with a one-off Ruger marked CRKT knife at 34 and change.